The Potato Puppet Playground has elements for all - those who are a little shy can simply sit back in our Potato Parlour and enjoy the tales. Those who are feeling creative can get busy and make puppets, with all sorts of tools and paints and bits and bobs to decorate with. If they want, they can go to town and create standalone Potato Paintings - the most impressive are then housed in our Potato Gallery and used as backdrops in the Potato Theatre. And of course, for the budding bards, the promising players, there is every opportunity to perform and become a temporary member of our travelling troupe. can you find the one special story? Our proud leader Sailor Sawney has had a curse put on him, and he's been locked inside a potato! The only way to save him is to travel the lands and find the One Special Story that will teach us the true value of friendship, and release him from his starchy cell! It has been said that the One Special Story plucked out from the earthy fields will be a mixture of ancient legend, Welsh folklore, and invented myth inspired by the characters and settings suggested by the guests in our Potato Parlour. We will journey to the Otherworld, visit glass fortresses, drink from magical cauldrons - all the while keeping our eyes (and spuds) peeled for the terrifying Potato-Eye-Eating-Man, a monstrous villain who will purée any potato in his path! 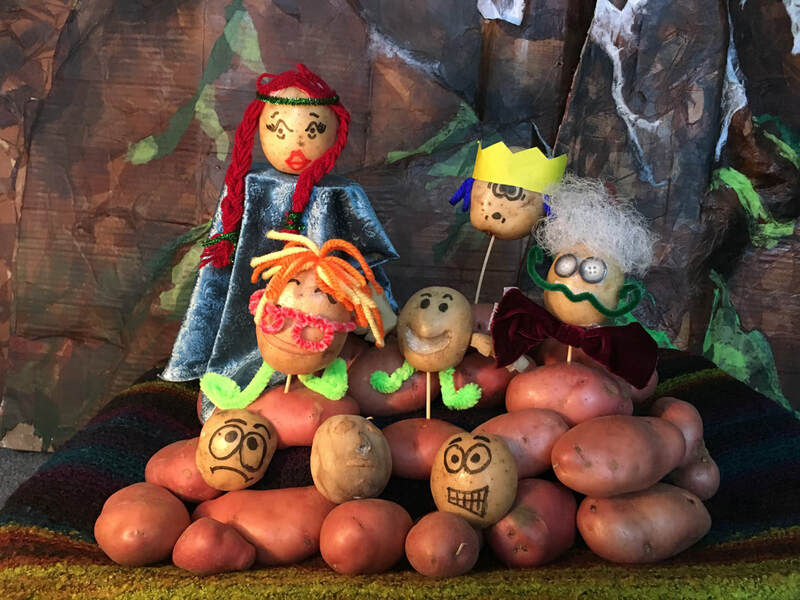 The Potato Puppet Playground will be touring further venues and festivals in 2018. Check back here regularly for more details of when you can be a part of our spud-tastic adventures.